Even though in the men category some of the profiles disappeared, the level and number kept the standard high. Antanas Klibavičius / Lithuania, Anatolii Zhuravel / Ukraine / Salahat Hasanov / Azerbaijan, George Suciu / Romania – all top fighters that was registered, but could not make it this time. Pictures in this article: Black/white Piotr Sztencel / PI-photo.pl visit form more! To keep the standard high, and not fall into a trend like “quantity rather than quality” is a keyword. Looking around we all can see that the a fierce frequency in this to organize tournaments makes the quality fall, the number of performers are getting lower. This results in a drop in value when it comes to championship, and when you fall to a bottom level you get offers on cheap EC and WC medals. 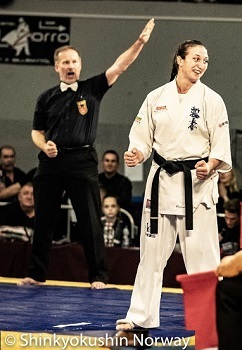 This is a collective responsibility for Karate’s full contact, keeping their tournaments and levels up to an acceptable and respectable level.With this in mind, one can be very pleased with how WKO / EKO emphasizes its activities and events, and not least how they strengthen each other. 36 fighters, 5 or 6 fights to the top spot – in this case it became 5. Ivanka Deleva / Bulgaria became the champion in a very hard division! 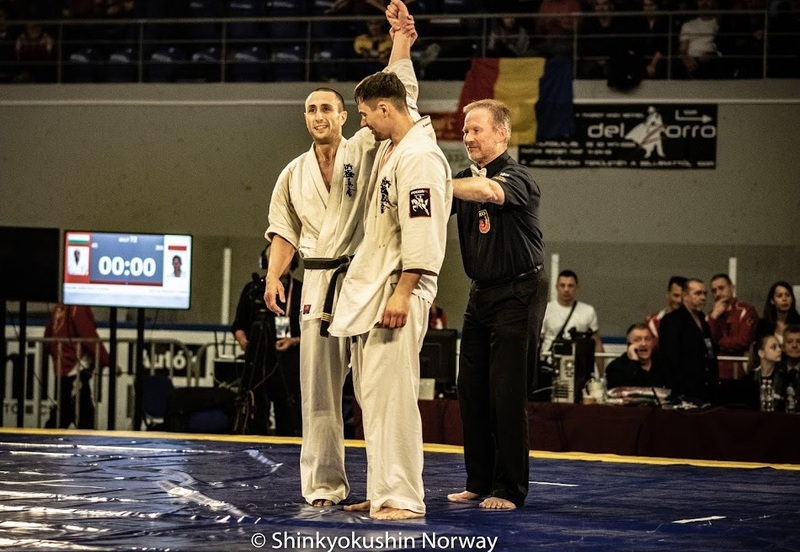 Runner up in the EC this spring in the -65 kg category. First win of the fay for Deleva was against EC Champion (-50kg) Alona Veresniak / Ukraine. Deleva being the strongest one, and getting the flag after ordinary round. Veresniak showed very good skills. Next fight for Deleva was a sweet revenge from the EC in Poland this spring, and collects a good win against Monika Zielińska / Poland, and that after 5 minutes of raw fighting from both fighters. 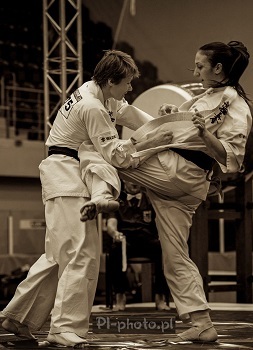 Zielińska with her very strong knees and combos, Deleva with her strong pressure and furious finish! Third fight for Deleva was against a very movable Erika Žeburtovič / Lithuania. Despite good mobility from side to side, Erika does not have what it takes and the decision comes after the regular round. This fight was the first of three, where Lithuania was on the other side of the mat. Fourth fight for Deleva was against Rūta Brazdžionytė / Lithuania, who has been on the EC podium several times. Brazdžionytė on her side had been soften up by facing Marta Lubos, and before that Christine Buchholtz / Denmark. In Brazdžionytė third fight she met Aneta Meskauskiene, and Meskauskiene became a little topic of discussion when it came to nationality. The case is that Aneta Meskauskiene fights out from Lithuania and Ireland. Representing Ireland (IFK) in October, Lithuania in this case in November, back to representing Ireland in December again. We do not see this as a problem, but of course if you are a fighter and will count the spots to the World Championship as an example, this will matter. We believe that she will fight in the World Championship ext year, but it might be as “Irish” and out from KWU. Top fighter – no doubt, and giving Brazdžionytė a hard fight, before the decision was taken on weight by Brazdžionytė. This win made Brazdžionytė ready for fight 4, and in the weight case – now the “shoe was on the other foot” facing Eider Cardenosa / Spain. Eider Cardenosa made one of her strongest tournament, taking to wins and into the top 8. But in this case the 50 kg fighter had been teared down, and in the fight against Brazdžionytė it was stop. Brazdžionytė vs Deleva was a high pace fight, and of course at this point the large category and number of fights against top fighters began to play an significant role. But as in previous fights, Deleva’s pace and drive into the last part of the fight is to strong to stop! This meant that Bulgaria was ready for the final – and could Deleva manage to pull of a strong enough fight this time? Because on the other side of the mat multiply champion Inga Mikštaitė..Inga Mikštaitė was moving through the tournament as expected. First win against Johannessen / Norway, then a win against Diana Balsyte / Lithuania on flags, before a tough fight taken on weight against Brigita Gustaitytė / Lithuania. In the fourth fight it was Agata Winiarska / Poland that was ready. Winiarska with notable wins against Noemi Baldres / Spain, Nora Vaznelytė / Lithuania in a hard second fight and third win against Svitlana Lagno / Ukraine. Mikštaitė vs Winiarska is a good fight, an it goes into extension. Many good exchanges, but in the last part of the fight Mikštaitė manage to outpace Winiarska for the win, but during the fight it could look like Winiarska’s low-kicks did find their way. With 3 wins Winiarska ended in a good 3rd place, together with Lithuanian fighter Rūta Brazdžionytė. If we remember correct, this is the strongest Open-weight for Brazdžionytė, as for Winiarska this is the 3rd time she manage to take 3rd place in European Open-weight championship – 2014,2016 and now in 2018. The final between the heavy favorite Inga Mikštaitė and Ivanka Deleva, is a fireworks of a fight, and the pace is very high. 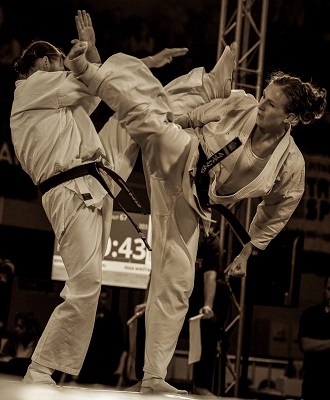 Mikštaitė holding her specialty, high pace fighting – but this time her opponent do not back down. Ivanka Deleva answering every attack and also keeping the pace. 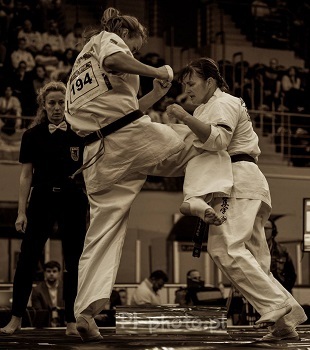 Into the extra round the same pace, but we can see that Ivanka Deleva mainly now only uses her arms, moving and punching – and Mikštaitė is the one who are being moved back. The fights ends, and the most knows – or believe that it will go to Bulgaria, and looking at the face of Mikštaitė, that she also feel the same. The champion in a very convincing way: Ivanka Deleva, Bulgaria! As all know, this was the day of Bulgaria. How can we put this..? Valeri Dimitrov – once again! But for us, and many, it was more the way he did it, rather than as he did it. Surprising more than one top fighter, outpacing them with fast punching combinations. Of course, the champion knows more than that, but far as one could see, many of the fighters was completely gassed – even the top fighter he meet in the final. 44 fighters was down to 38, but anyway it is a long way to the top. In a similar Open-weight this Autumn that use to be the biggest, the number of fighters was 12 women and 26 men. This gives us a little perspective. Valeri Dimitrov won five fights, against very strong opponents. Many of them has been fighting across the World and organizations, taking heavy tittles as World Champion and opens to mention some. First fight for Dimitrov was against Romanian fighter Mihai Prodea. Prodea with one win already, and went directly in attack, specially on Dimitrov’s leg, and the heel-kick comes often. Mixing it nicely up with punches as well. Dimitrov turns up the pace,moves and works the body and stomach. Into an extra round, and the pattern is mostly the same. The heel-kick from Prodea still comes, and yes the heel-kick Dimitrov also know. Further on in the fight, Prodea begins to feel it, and Dimitrov’s body shots are really takes it’s toll. Dimitrov takes it, Prodea should be proud. Second fight for Dimitrov is against Etibar Agalaroglu / Azerbaijan. Agalaroglu coming on strong, but Dimitrov finding his leg, thigh, and clearly hurts him. But Agalaroglu is hard and keep it up, but after 3 minutes it is a clear 5-0 victory to Dimitrov. Third fight for Dimitrov was against Vytautas Cėpla / Lithuania. Not the first time these two meets on the mat, and up to now Dimitrov has been victorious. 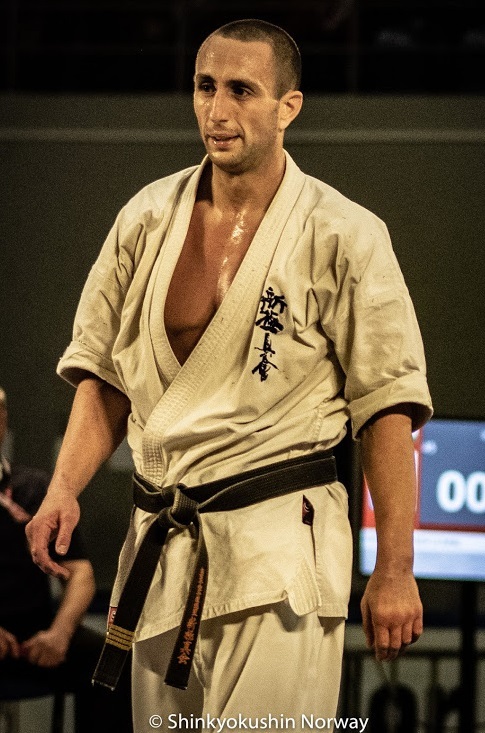 Cėpla on his way had notable wins against Andras David / Hungary – 3rd in the EC +95 kg this Spring, and against Marek Wolny / Poland – well known from several tournaments. This fight is over in ordinary time, in this fight Dimitrov rapid series with punches really showed a difference! Many, and maybe Vytautas Cėpla expected something else, based on earlier fights – anyway 5-0 Dimitrov. Next fight: Edgard Sečinski / Lithuania vs Valeri Dimitrov. Also been fighting against each other several times before. 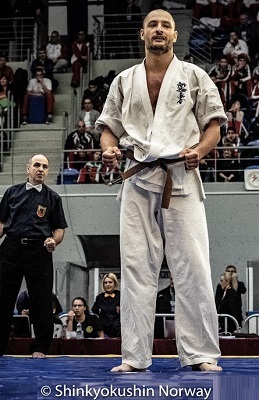 Sečinski world champion in KWU last year, also 4th place at 1st JFKO / WFKO championship this spring. This fight became close to a rerun from the Dimitrov – Cėpla fight. Up to a certain point, it was an even fight, but again Dimitrov outpaces his opponent and gets a 5-0 win. Reading this, it “looks” easy, but we can only images ..
Maciej Mazur / Poland, consider to be one of the favorites, and that with a good reason. Maciej Mazur has been really strong, and seems only to go in the right direction. Mazur really looks relaxed, and saves energy to use it at the right time. Strong, and have always a very good stamina. First win against Tengiz Bastoiani / Georgia after 3 minutes. Next vs Jean-Paul Jacquot / France who was representing KWU. Mazur is strong, and Jean-paul Jacquot is’t exactly weak he either – and for sure he is not made of glass! A hard fight with many heavy hitters, and it’s going into extra round. 2 hard minutes more, this round it seems that it is Mazur who is closing the distance from start, and being more active that the first round. But it is even, very even and the results are weight… but not enough difference – and 2 more minutes. This time the will to win are coming more and more and the fight becomes more wild, Mazur adds series with punches to the same side, and tip it in his favor. Next fight for Mazur was against Miroslav Milev / Bulgaria. Milev is a really good technical fighter, and prove this in his previous fights. 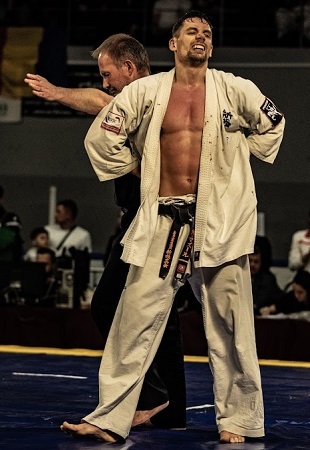 On his way he beat Justinas Kvietka / Lithuania among others, the Lithuanian fighter recently won British Open IFK tournament. But in this case, the Bulgarian fighter became overpowered by Mazur. Mazur on his side clearly focusing on keeping it light and fast, and did also add a more technical aspect to it. 5-0 to Mazur. Kęstutis Radvila / Lithuania was the next obstacle for Mazur. The Lithuanian fighter became runner up in the KWU world champion last year. On his way he had a hard fight vs countryman Eventas Gužauskas – on weight decision. Mazur vs Radvila became a proof of Muzur’s strength. Really taking the legs from Radvila with strong low-kicks. Once again Mazur added a nice detail, combining low-kicks and sweeps, taking the standing leg of Radvila when he tried to lift his leg in defense. Clear victory 5-0 Mazur. The final Valeri Dimitrov vs Maciej Mazur. Mazur going hard at Dimitrov’s leg from the start, Dimitrov on his side moves, working his punches. And it seems that they slowly but sure find their way more and more. But Mazur punishing Dimitrov’s legs as an answer. As the time goes the pace raises, and Dimitrov’s series of punches begins to show, but Mazur pushing hard forward adding knees to the body – Dimitrov not backing an inch keep the pressure constant! 4 flags extra round 1 flag for Mazur. 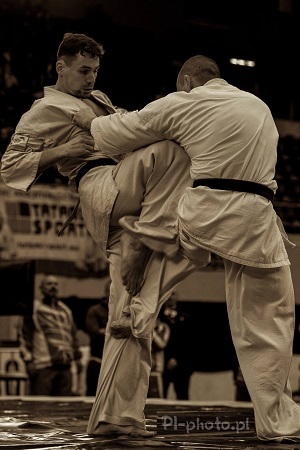 Into the extra round Mazur seems heavier on his feet, and when his kicks are thrown it is clear that he is tired – but still keeping a very high level. Further Mazur are going into a phase with more use of his hands, as Dimitrov still keeping a high pace in moving and punching. In the end of this round it is an insane pace we witness – and there is no tomorrow! Decision – 5 flags for one more round.The 2nd extension.. Mazur starts this round putting his hands on his hips.. This round is just amazing.. Dimitrov still holding his high pace, and punishing Mazur with flurries of punches to the body, moving, and the same. Mazur showing incredible spirit, and fights back with whats left – and he does it well. But as said, Valeri Dimitrov is all over the place, and when the round and fights signal comes, Mazur stumbles toward his line. European Open weigh champion Valeri Dimitrov! We can only thank all part that are involved! This entry was posted in Ringside, Tournaments and tagged Macej Mazur, shinkyokushin, valeri dimitrov by Steffen. Bookmark the permalink.